You can link to any page in the book. 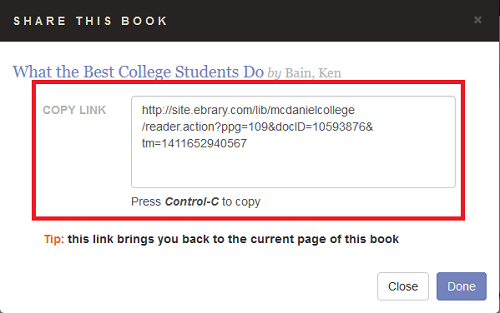 Go to the page you want to link to (typically the main book record or the first page of a chapter). At the top of the page, click on the "Share Link" icon. Copy the link and paste into the Library Link Proxifier. NOTE that you will want to verify that the item still exists before each term - library subscriptions to electronic items are not always permanent. If the eBook you are using has disappeared, contact the library to investigate other means of accessing that item.